The quality of the recording of sarcomere length depends on several parameters which can be optimized to improve the results. Nota bene: According to Nyquist-Shannon theorem, the pixel size has to allow at least 4 pixels per sarcomere at the maximum of the contraction i.e. the shortest distance between sarcomeres. 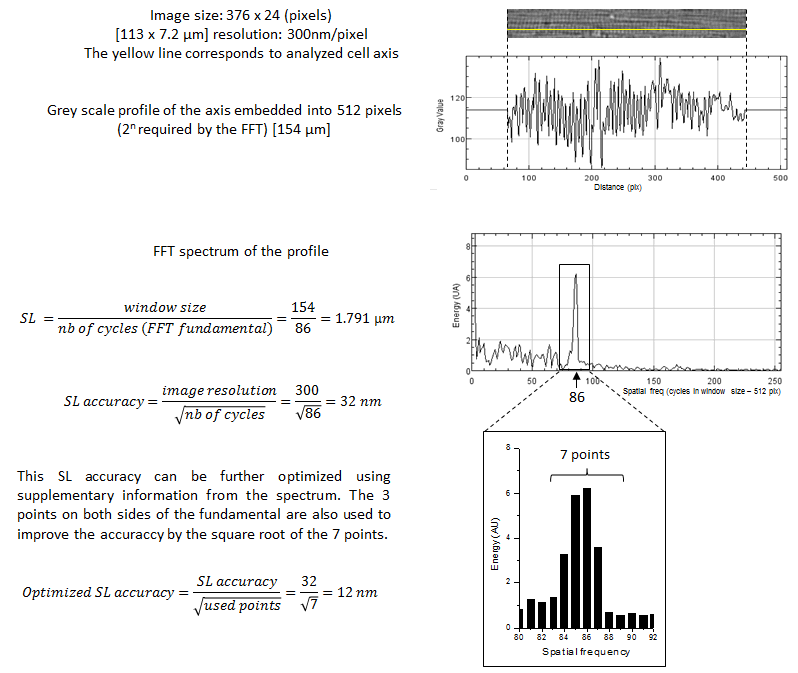 In our example, for a sarcomere length of 1.5 µm, there should be less than 103 cycles in the window size (512 pixels) i.e. ~5 pixels per sarcomere. · Temporal resolution: set by the video camera frame rate. The video camera frame rate (FR) can be enhanced by selecting a Region Of Interest (ROI) and using the binning mode. Using ROI increases the FR by reducing the used size of the camera sensor. Binning mode increases the FR and the light sensitivity but decreases the spatial resolution. Here an IDS UI-1220LE-M-GL digital video camera was used with ROI and binning modes for a final resolution of 376 x 24 pixels allowing a FR of 1000 Hz. This FR is rapid enough to record sarcomere length in contracting rat ventricular cardiomyocytes. Analogical video acquisition with a frame grabber is generally limited to 25 – 30 Hz FR or requires very specific material. Thus, it is better to use digital video cameras with FR which can reach 250 Hz with binning and ROI modes. These cameras are often not expensive (~ 300 $). · Light and contrast: the more contrast between isotropic and anisotropic bands, the higher is the peak in the FFT spectrum. This peak should be as narrow and high as possible. Be sure to obtain a single peak. · Focal plane: depth of field should be as small as possible to improve the signal. · Analysis axis: the analysis axis drawn along the longitudinal axis of the cardiomyocyte has to be as perpendicular as possible to sarcomeres. The quality of the FFT spectrum is greater when the length of the axis is equal to . is recommended.